It’s important to know that this is not a sponsored post. I have used Bac-Out for years to clean the bathroom, and get the odors out of mattresses — and, after so many people asking me about bathroom odors, I just wanted to share how much I love this product. However, after researching enzyme cleaners for this post, I was surprised to find so many people enzymes as a powerful all-surface cleaner — floors, glass, etc. So, today, I put the cleaner to the test. 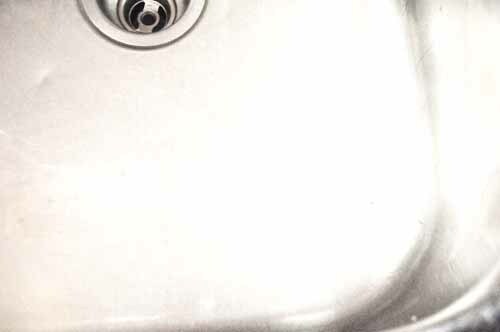 I have a stainless steel sink that is impossible to keep clean. I greeted it today only to find “dried cheese” staring at me… one of the toughest grimes known to my sink. The enzyme cleaners, people say, eliminate the use of elbow grease. Caked-on cheese screams of elbow grease power — — or a good, long soaking. If enzymes passed this test, I’d start using it for all of my cleaning. I sprayed the cheese, and the sink with the enzyme cleaner, Bac-Out . Do I wait? Do I dare to just wipe it off right away, just to prove it’s not that powerful? I couldn’t wait. I wiped it right off… and I mean, that caked-on cheese came right off. See photos of my dirty sink, transformed with a few wipes, to a shinny sink. 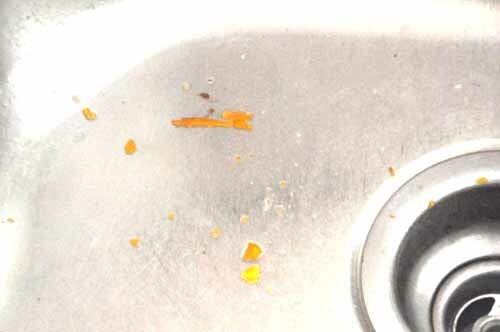 One dirty sink… with a serving of hardened melted cheese. Voila! Just a few squirts of enzymes, and one dirty rag later… And, not until I wrote this post, did I ever realize what a cleaning machine I had under my sink! Funny that I pick Super Bowl weekend to post the answer to this long-sought after question. (Yes, people ask me this all the time.) To get your bathroom clean, you have to get it clean. I know you’ve tried that — but it’s not working. You’ve used bleach, ammonia, baking soda and vinegar — and your bathroom still has an “odor.” I know exactly what you’re talking about — I have four boys. The problem is not you, or your lack of thoroughness — it’s with the type of cleaner you’re using. Your goal is to remove odors, rather than mask them, by cleaning the source of the odor. Thankfully, you don’t need a “harsher” chemical. The key is in the enzymes. Enzymes are a biodegradable, non-toxic cleaning agent that are quite effective at removing odors because they break down the grime causing the odors. Detergents do not do this. Enzymes also work faster on stains than regular chemical cleaners, by breaking down dirt and urine into their basic elements: oxygen, hydrogen and proteins. labeled “green” are enzyme cleaners. So, you do not need a “harsher” chemical to get rid of those smells — you need an enzyme. Where to find them? You can usually find them in pet stores (for pet odors) but those products usually smell awful — and I’m not sure how well they work. The one I use is Bac-Out , which is usually on the shelves at Kroger (organic section) and Whole Foods. This one has a great citrus scent. I also use this to spray the mattresses the morning after an accident — and it does eliminate that horrible odor. If you’re ambitious, you can also make your own enzyme cleaner…For that recipe, click here. There are also more tips on how to use this cleaner all around your house — including glass — which I had never thought of before!